Just added a new motorcycle racing poster to my collection. 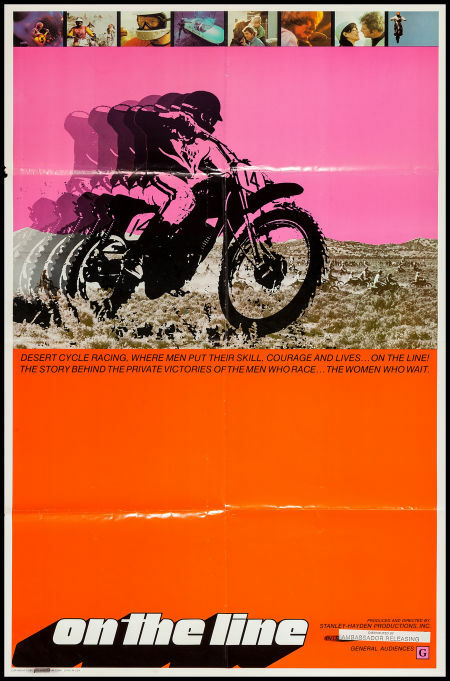 It is from the 1972 desert racing documentary called On The Line. Update: I have decided that I do not want to hang on to this poster so I listed it on Etsy. I have come to the realization that i can’t collect every category so motocross is the first to go. I still cannot find any information on this rare film and have neveer seen another copy of this poster. The white lines you see on this photo are light reflections, as this poster was folded. The colors are bright and strong. This entry was posted on Wednesday, December 5th, 2012 at 12:38 pm	and tagged with motocross poster, motorcycle racing poster, vintage motorcycle poster and posted in Motorcycles, Scooters & Automobiles, Posters and Ephemera. You can follow any responses to this entry through the RSS 2.0 feed.